City officials put off an expected discussion of a proposed tax increase this week, a delay one City Council member said would benefit the public, which seems unaware that two different sales tax approaches are under consideration. The discussion over the controversial potential sales tax measure on the November ballot, originally planned for this week’s City Council agenda, was postponed until Tuesday, July 17. Mayor Kelly Boyd missed the July 10 meeting due to ill health and wanted to be a part of the discussion and decision on the matter, City Manager John Pietig said. The proposed ballot measure would raise local sales tax to 8.75 percent from 7.75 percent, or a 12.9 percent increase, which would be the highest in the county. 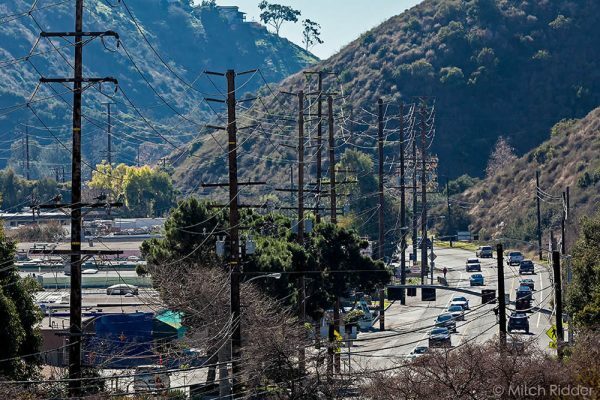 City officials intend to use the extra revenue to underwrite a safety measure, the burying of utility wires along Laguna Canyon Road and other key roads. Power lines in Laguna Canyon. At issue is whether the council intends a ballot measure that promises to dedicate extra revenue solely to the undergrounding project, which would require a two-thirds majority vote for passage, or a more broadly written general purpose tax measure, which would require a simple majority for passage. Council member Steve Dicterow found a silver lining in the postponement. He admitted to being unaware until reviewing the past week’s agenda that a general sales tax rather than a special tax was under consideration. He said he couldn’t recall a public discussion of the options previously. Assistant City Manager Shohreh Dupuis said there was a question in the city’s initial community survey asking residents whether they would support a special tax or a general tax, and that the options were discussed among a council subcommittee. Dupuis said the general tax idea was dropped due to a potential November ballot measure that would have limited the ability of cities and counties statewide to raise local taxes by requiring a two-thirds vote. Since then, Gov. Jerry Brown signed legislation on June 28 that removed that proposition from the ballot. With that issue off the table, Dupuis said the subcommittee worked with city staff to revive the option of pursuing a general sales tax. Dicterow noted that while a special purpose tax has earmarked funds that require a vote of the public to reallocate, a general purpose tax is spent based on a council-approved expenditure plan that can change from year to year. “There’s been, from my perspective, a real shift in what the debate is going to be about next week,” Dicterow said. The July 17 council meeting will begin at 6 p.m. at City Hall. For more information on the ballot measure, visitwww.lagunabeachcity.net. I find this headline to be misleading to the public on this extremely important matter. The headline posted today July 17,2018 “Ballot Measure Decision Put Off” leads people to believe it has been put off again. Shame on Andrea Adelson and Allison Jarrell for this obvious attempt to mislead the residents of Laguna Beach. It truly shows that the Laguna Beach “Independent” is far from independent and has shown time and time again they are in bed with the city government and do not represent the residents of Laguna Beach. Shame Shame!! !